Chrysler is attracting attention in the Middle East with “The Performer”, an integrated advertising campaign in which Saudi Arabian Hip Hop celebrity Qusai duels musically with the new Chrysler 300C, in association with Arabs Got Talent show. The soundtrack was composed in its entirety with sounds recorded from the actual car, turning the Chrysler 300C into a real polyphonic musical instrument. Sound engineers recorded a range of sounds, from doors slamming, petrol flaps opening, to the roaring engine itself. A virtual poliphonic synthesizer called “The Perfomer” was developed to create the original track. Four 30 second documentaries document the process leading up to the launch of the Performer commercial, each serving as a teaser broadcast on TV before the reveal of the main performance. a QR code on YouTube allowed users to download and create beats and melodies on their own devices using the Performer. The innovation has also been sent to musicians and composers across the world for them to use as an instrument. A three minute tutorial video, released online, provides an introduction to the multi-patch instrument for N.I. Kontakt sampler. The Performer campaign won one Gold (Media), one Bronze (Interactive), and various shortlists at the Dubai Lynx 2015 awards. The Performer App pairs with the Chrysler 300C Performer poster enabling you to play the car like a musical instrument. All the sounds are sampled from the Chrysler 300C which embodies world-class levels of craftsmanship and technology, as refined and inspiring as a world class musical instrument. The accompanying poster has been printed with conductive ink that when touched generates the sounds of the car through your smart phone. Chrysler Middle East sponsored Arabs Got Talent (AGT) for the 2nd successive year. The sponsorship platform provides significant reach and visibility for the Chrysler brand. Instead of airing a generic TV spot, the objective was to establish a connection between Chrysler and AGT, enabling a clear association between brand and program, increasing the brand awareness among young arabs. To achieve this we partnered with co-host of AGT, Qusai, to turn the Chrysler 300C into a musical instrument, sampling extensively each and every sound from the car. The campaign followed the format of the show. 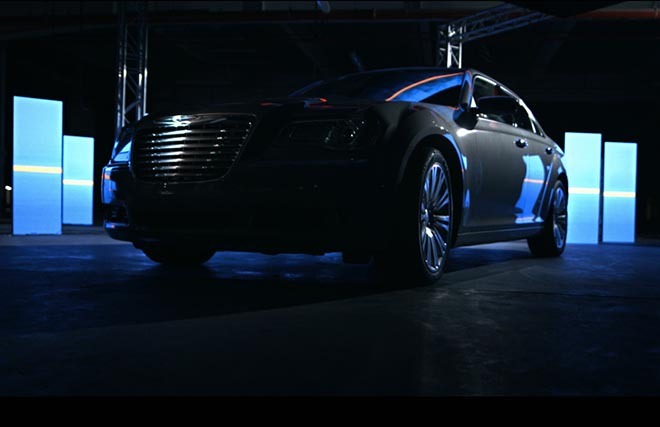 During the ‘Audition’ stage our 4-week TV campaign aired individual chapters each week following Qusai and our sound engineers exploring, identifying and ‘sampling’ the sounds of the Chrysler 300C. The culmination of the 4 chapters was the final 60” TVC of which the soundtrack was composed, arranged and produced using only sounds from the Chrysler 300C. To support the TV campaign, the region’s first playable posters and the world’s first re-targetable press inserts were created; allowing users to play the Chrysler 300C like a musical instrument from the printed material connected via Bluetooth to the user’s smartphone which became the speaker/amp. This concept was complemented online via a digital banner campaign on YouTube and across the Google Network, in which the user could play the car’s sounds using their smartphone as a piano keyboard after connecting it to the banner, via Google Channel Connect. A promotional campaign in showrooms rewarded people test driving the Chrysler 300C with a Performer Kit containing a playable poster with headphones. Finally, all the sounds sampled from the car, were mastered in a professional software musical instrument and sent to top influential music producers and hip hop artists across the region and internationally, as a Direct Mailing piece. AGT’s co-host Qusai helped uncover the talent of the Chrysler 300C by turning it into a musical instrument, detailing the whole process as a five-parts documentary. This engaging TV content took viewers on a 5-week journey that mirrored the format of AGT. During the show’s audition phase, in fact, we aired the chapters about the sound sampling process, while during the show’s live phase, we aired the 60” TVC, of which the soundtrack had been composed, arranged and performed using only, and exclusively, sounds from the Chrsyler 300C. Even though the campaign only went live on January 3rd, within 8 days Facebook video views exceeded 2million, worth 4 years of streaming time, and the test drive requests increased by 286% year on year. The Chrysler The Performer campaign was developed for Chrysler Middle East at Publicis ME/Dubai by chief creative officer Bechara Mouzannar, regional executive creative director Alex Brunori, creative director/art director Arvind Krishnan, associate creative director/art director Avinash Namadhari, client services director Charles Eddy, associate account director Hani Tayeh and agency producer Andreea Mititiuc. Filming was shot by director/editor Luigi Pane (commercial) and co-director/editor Francesco Caradonna (documentaries) via abstr^ct:groove with executive producer Giada Risso, cinematographer Diego Indraccolo, line producer Claudia Amendola, producer Alessandro Salerno, 1st assistant director Alice Gatti, camera and steadicam operator Emiliano Leurini, colourist Daniel Palluca, animator Valentina Vicini. Service in Dubai was produced by Joy Films by executive producer Dania Quaglio and producer Chiara Maioni. LED installation designed by abstr^ct:groove. Original music by Qusai was mixed by programmer/arranger Juri Ricotti, 300C sounds recording engineer Pierpaolo Caputo, sound designers Daniele Famà and Michele Benedetti (Gigasound studio).